Thank you for the response! 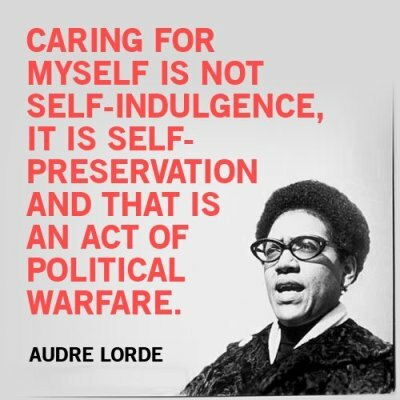 And the quote from Audre Lorde – that says it all. As a child in a family that came out of the culture of previous movements… the idea that you can be sustainable, be a contributing part of your family, be present as a partner and a community member WITHOUT caring for oneself has proven (in my life experience) to be false and without deep, lasting consequences. I don’t mean go to a yoga retreat (although that’s great! )… I mean going to the doctor if you are sick, sleeping, listening to what your spirit says, eating healthy, simply breathing without thinking that you must struggle in order to have a worthy life. I don’t want to be part of a movement where I can’t ask “how are you doing?” without feeling guilty for not picking up a picket sign or signing up for childcare. Of course we all do what we can (! ); and there are limits to everything. I felt politically clear when I was 25 – but I also thought in black and white and I had simple answers. Now – I feel more open, I feel more depth to my commitment after weathering burn out and having a child, I feel less Certain about anything. Do I wish I meditated more? Yes! But I don’t judge folks or look disapprovingly if people don’t. That judgment – who is better than whom – is exactly what meditative practice is about getting out of. I think we have shallow understandings of what meditation, “self-care”, or spiritual practices are for. We can make them into just another way to make ourselves and other people feel guilty, not good enough, re-enforce the differences in power and privilege. For me, self-determined care is about bringing my best self in inter-being with the community and the movement; to contribute more effectively. Its about being able to sustain over the long haul and also not neglect my family. Thank you for writing such a thoughtful response and so quickly. The short response-response is “Yes yes and yes!” Absolutely everything yes. it adds, it corrects, it clarifies. I’m going to marinate on it more to see what else may percolate out but for now my deep appreciation for you, your words, your thoughts, and for stirring up this crucial conversation. Thank you for this, Adrienne. I find the idea of “self-determined care” very helpful. Thank you so much for this response. So grateful for bloggers who can clearly articulate what so many of us feel. We deserve our own love. I’ve seen the lack of self-care play out in damaging ways… And how we model burnout to young people. In communities where all the messages we get (from media, family, etc.) are that we are not worth loving, self-care is indeed an act of survival. Self-care is not selfish. It is a path to healing from childhood, adulthood, daily, and inherited traumas. It is remembering that healing our selves creates healthier communities. Thank you for this. As a healer, yoga teacher, bodyworker, etc., seeing widespread burnout and lack of self care in my political community was a big part of my inspiration in choosing this path. I have been having this conversation in my brain for quite some time. How do I, in my role, create supportive offerings that will facilitate long-term, community-wide, holistic self-determined care? (I *love* that phrase.) How do we shift the conversation toward a long-term approach to healing (rather than the band-aid approach)? How do we see the care and healing we offer ourselves (and each other) as a part of the larger healing work that we do as a movement? After taking time to consider what is necessary and supportive for me, I am happily doing my movement work alongside my healing arts practice in a way that feels balanced and rightful. I see no separation between these and, in fact, they deepen my capacities in each. Thank you for this writing. It is so important. I am grateful from the bottom of my heart. of course we should do our best to take care of ourselves in the ways that we need and what makes sense of us, especially as we struggle against various systems that tell us that we are worthless and undeserving of very basic things like housing and food. i guess where i struggle with the discourse around self-care is that there seems (at least from my perspective) an assumption that everyone’s abilities are the same. what about those of us who can’t practice self-care, even if in a self-determined way, because we struggle with illnesses and disabilities? i so often feel left out of these discussions about self-care because there are things that i have not been able to do for myself because i was too sick. while communities can come into play in these situations, i find that the idea of collective responsibility is hard to turn into practice. despite our best intentions, we conveniently forget about people in our communities. they’ve gotten ill or depressed or are incarcerated, and they’re not at activist events anymore. we forget those people who have become socially isolated. so i’m not even sure if “community care” is enough when this idea privileges those who are able to be a visible part of the community. to me the idea of self-determined care comes into play precisely because everyone has such different abilities and needs. so what seems like self-care to one person might be physically, financially, emotionally or mentally impossible to another, or simply not what they want or need. beyond the basic things like drinking water and going to the bathroom, almost every other need adjusts for each person. i find ability and self-care for each person also changes with time – we are not static creatures. what makes it possible for community care to be possible in the spaces where i have seen glimpses of success is that everyone is able to articulate their needs. so the focus isn’t on charitably taking care of one sick person, but on deeply valuing the contributions of everyone in the community, including those who are chronically ill, differently abled, financially tight – and acting from that valuing instead of from obligation, pity. i agree, it is easy to forget each other when we get sick, our society is all about paying attention to who shows up, not who is absent. but the more we learn to be vulnerable with each other about our real needs, to say them out loud, the more possible communities of care become. i am practicing this on a small scale with my family and a few close friends, saying “i need help” instead of suffering alone and building the story of my loneliness. i will continue to be transparent about the experiment, but so far its been transformative. thanks for being in conversation on this!